Waiting For The Boats At Rock Harbor On Cape Cod. Rock Harbor has two launch areas where you can put your boats in, one on the Orleans side and one on the Eastham side. 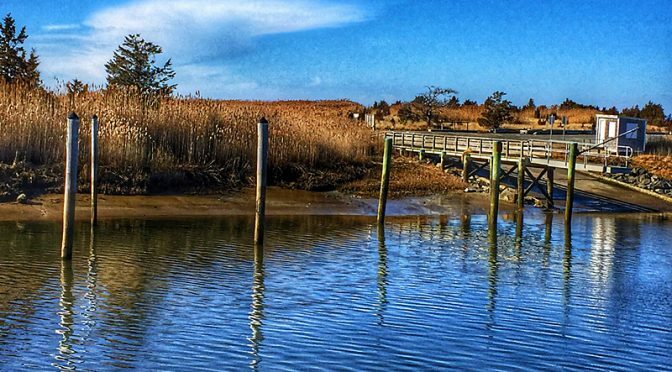 This photograph is looking across the harbor from Orleans to the Harbor Master’s house and launch ramp in Eastham. Pretty soon the place will be busy! Black And White Buffleheads At Rock Harbor On Cape Cod. 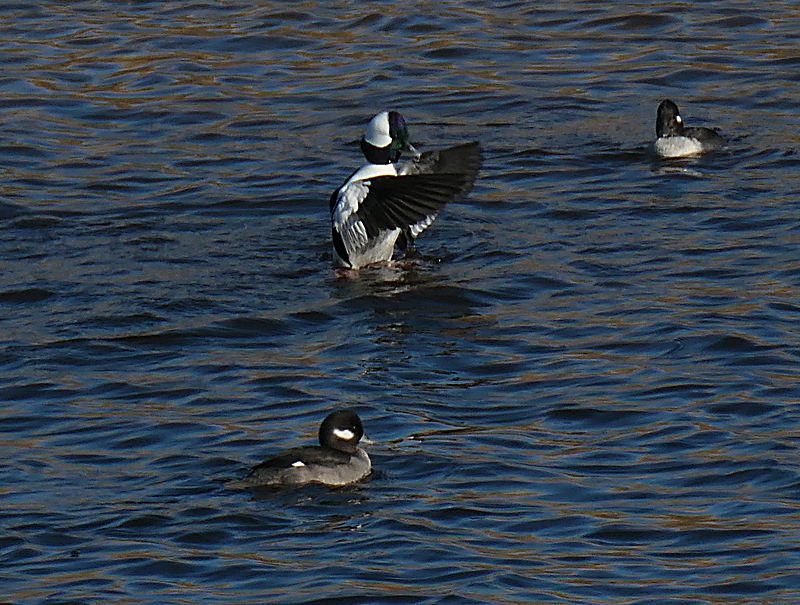 I love to see the Buffleheads swimming about in the winter here on Cape Cod. They are so distinct with their black and white coloring. I’ve seen many of them at Boat Meadow Creek and at Rock Harbor. They are pretty skittish if they see you or hear you, so it is easier to take a photograph at Rock Harbor where they are further away and there’s some noise about. This male was flapping his wings as the 2 females swam nearby. There is such a difference between the males and females. 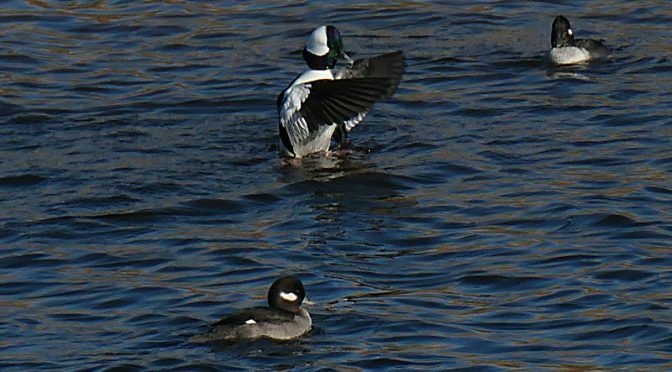 Have you ever seen a Bufflehead? Cool-looking, don’t you think? 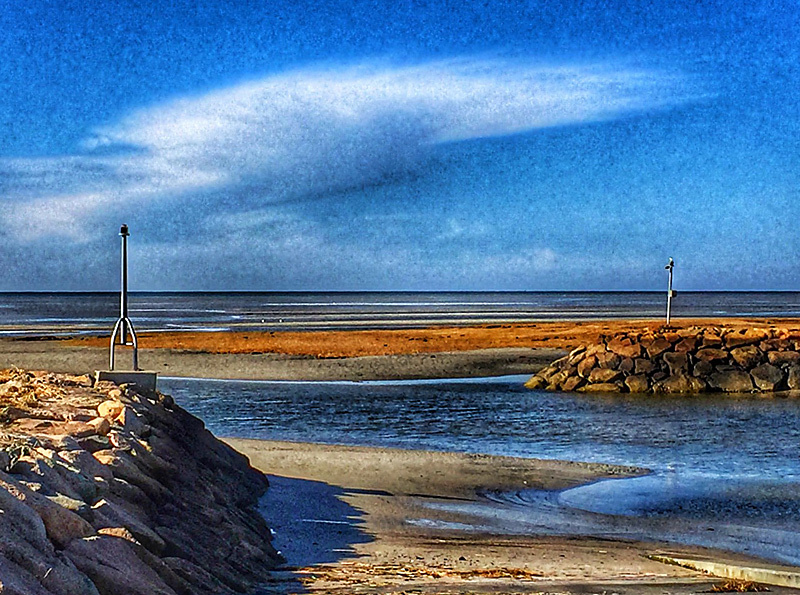 Beautiful Clouds At Rock Harbor In Orleans On Cape Cod. Rock Harbor was just spectacular the other day. I loved the clouds in the blue, blue sky with the tide going out. It almost looks like spring it is around the corner! Common Eider At Rock Harbor On Cape Cod. 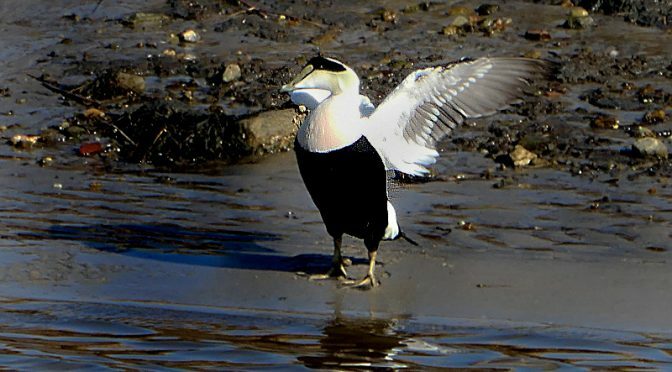 This Common Eider was drying off his wings after a swim at Rock Harbor. I’ve seen many different species of winter birds at Rock Harbor in the past few weeks. Beautiful bird, don’t you think? Love his pose! 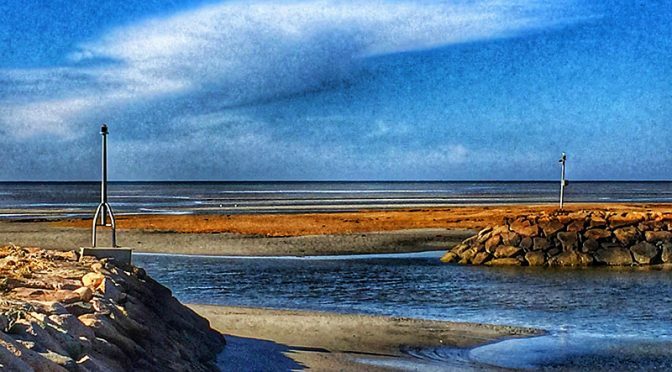 A Little Chilly For A Picnic At Rock Harbor On Cape Cod. 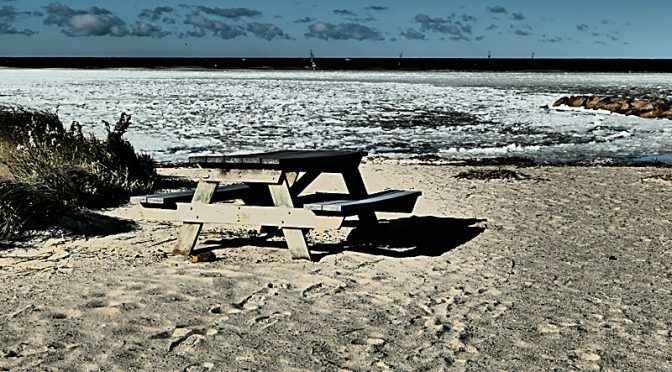 I love this picnic table at Rock Harbor, but it does a look a bit chilly for a picnic, don’t you think? 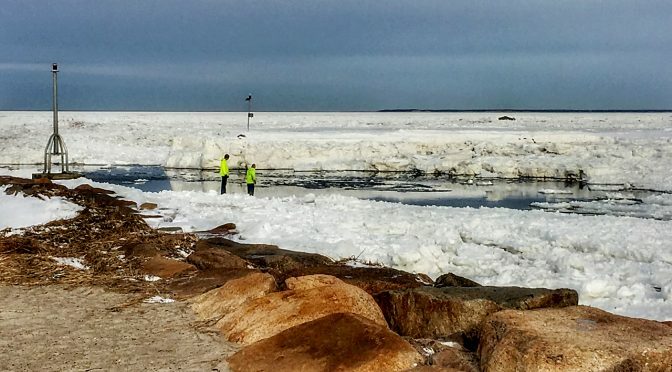 The Ice Is Really High At Rock Harbor On Cape Cod! We were so surprised to see how thick the ice was at Rock Harbor yesterday. You can see how small the 2 people on the launch ramp look next to the snow on the sides of the channel. It looks like the snow is about 8-10 feet thick. Can you see the huge rock from which Rock Harbor got its name in the distance on the right? That is one massive boulder! Pretty impressive, don’t you think?